Anirudh Thapa dished out a midfield masterclass that nullified ATK’s attacking threat and setup a brilliant comeback victory for Chennaiyin FC. Partnering his international teammate, Dhanpal Ganesh, in the double pivot of a 4-2-3-1, Thapa played the perfect box-to-box role. In stark contrast to his opposite number, Shankar Sampingraj, Thapa was everywhere – demanding the ball while in possession and tireless in harrying the opposition, when not. He was so good on the night that, for a brief period in the first half, he seemed to be the target of some hefty challenges from the ATK players. The diminutive midfielder hardly gave the ball away and even won most of his aerial duels. Thapa’s excellent performance was accentuated by his dead-ball skills, which received just reward in the 52nd minute when Mailson Alves headed in the equaliser from a perfectly floated corner. Casting the tangibles aside, what was particularly impressive about Thapa’s performance was his composure, intelligent utilization of space and game awareness. The boy, hardly 20, never looked out of place or flustered by the occasion. On the contrary, he managed to always find half a yard to receive a pass and keep the game moving. Yet, his most telling contribution was managing the game, especially in the final minutes when his side was defending the 1-2 lead. Another unmissable part of Thapa’s game is his dead-ball skills – he is already Chennaiyin’s dead-ball specialist, a skill he has been consistently harnessing, apart from possessing a mean free-kick in his arsenal. Those who were watching Thapa for the first time were pleasantly surprised but the few who have covered the grassroots of Indian football, over the years, have grown accustomed to such performances which has seen him become a regular in the U-23 national side, a member of the senior national team and now a routine feature in the starting line-up of table-toppers, Chennaiyin FC. Having captained most of the sides he has been a part of since his India U-14 days, Anirudh is not afraid of shouldering responsibility. Thapa also possess the gift of calmness and the blessing of humility which makes this shy boy from Uttarakhand rather special. If Chennaiyin and India can take proper care of him, Anirudh Thapa has everything in him to be India’s midfield metronome for the next decade. Anyone associated with Indian football in the last few years would be well aware of Debjit Majumder. The ATK custodian who hails from the suburban town of HindMotor in the Hooghly district of West Bengal made headlines in early 2012 while playing for East Bengal. That was a rather forgettable outing for Debjit as he conceded 4 against unfancied opposition leading to his eventual release without any more game-time. Since then, Debjit has massively improved his game making him one of the best goalkeepers in the country. He has been awarded I-League’s best goalkeeper twice in the last three seasons and was ATK’s penalty shootout protagonist in the final of the ISL last season. But this season Debjit hasn’t been able to replicate the form that earned him a national call up. Majumder was particularly poor in the 1-4 home loss to FC Pune City which saw him getting dropped in favour of the 42-year-old Jussi Jääskeläinen in the next game. That he regained his position eventually was more due to the lack of any able back-up than his excellence. On his comeback, although Debjit hasn’t exactly revisited the woe of the aforementioned match, his performances have been extremely inconsistent. In every game he pulls off some blinders, preventing definite goals and yet he peculiarly manages to concede some terribly soft goals. 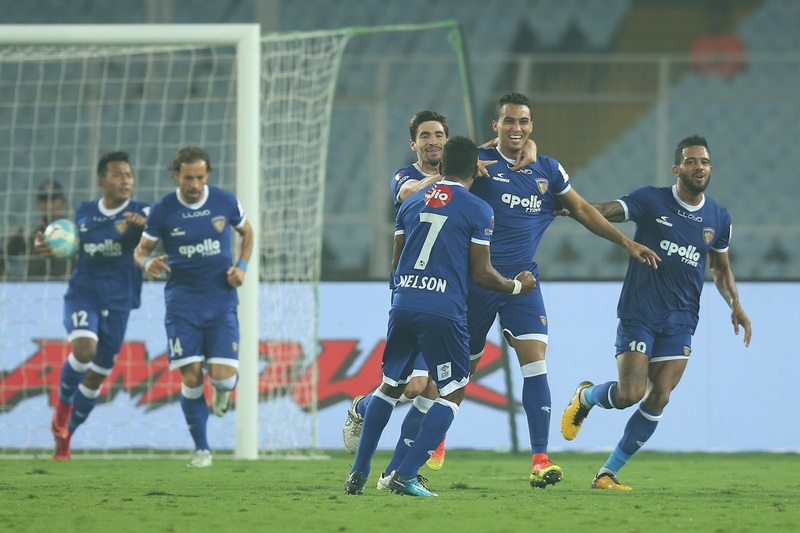 This game against Chennaiyin was a perfect tribute to Debjit’s erractic season wherein, in the 64th minute he spilled an innocuous cross from Inigo Calderon allowing Jeje to tap home the winner and then 7 minutes later, pulled off a stunning save to prevent Jeje from scoring his second from 12 yards out. Owing to a barrage of injuries and uninspiring performances, ATK’s title defence is coming to a tame end. Their poor output from the first 10 games led to the dismissal of their coach, Teddy Sheringham. The writing was on the wall for the former Manchester United striker, whose style of play, unlike his stint with the red devils, was hardly exciting. In his tenure, ATK have been extremely laboured in possession and unimaginative in their build-up, constantly resorting to hopeful long balls with minimal result. Apart from their opening match at Kochi against Kerala Blasters, they have been extremely predictable and slow in transitioning from defence into attack. Injuries haven’t been too kind to ATK either. Before the tournament started, they lost Carl Baker and during the first half of the season, the Kolkata outfit has suffered as many as 14 injuries to different players. Robbie Keane, ATK’s marquee man, has missed several games due to injury including this one and so has Anwar Ali. Eugeneson Lyngdoh, comfortably India’s most consistent midfielder in the last 5 years, had been ruled out of the tournament barely three games into it. Under interim coach Ashley Westwood, ATK echoed familiar discords that summarized their entire season hitherto in 90 minutes. They were poor in possession, slow on the break and lacked creativity. The only time the home side threatened the opposition goalkeeper was when Martin Paterson gave them the lead, pretty much against the run of play. Westwood couldn’t do much in the form of substitutes to change the game either as he had used up all three of his options from the bench before the hour mark, owing to injuries. And despite Westwood still harbouring hopes of a semi-final berth, when a team has more injuries than goals corresponding to their name, it is safe to say that their campaign has been rather forgettable.